Being less lame is the way to get youth interested enough to get themselves into kiting. Don't kid yourself, they will do it whatever way they want, not the way you lay it out for them. Last edited by jumptheshark on Wed Oct 03, 2018 1:13 pm, edited 1 time in total. So what is your take on the long and narrow Slingshot "Glide" for light wind? Is there a situation where this board makes sense? So why are you here? Is it not to present your views in a effort to help others understand as well as have your views challenged to further your own understanding? I remember discussion with you, even your fellow countryman is saying what's enough is enough. Your pics are so lame, proving nothing about the boards but how big your EGO is. I appreciate that you are here to kill some time. And for whatever reason you contribute, someone will likely get something out of that - hopefully some good. "Is it not to present your views in a effort to help others understand as well as have your views challenged to further your own understanding?" What's to understand about the taste? I think your statement is like "Homer Simpson Zen" or something along those lines. In kiteboarding, I came to understand very early on that "taste" is a feeling you get from your particular approach. What/how you ride, and why it makes you feel good, is something that is positively and absolutely conveyable to a large degree. My approach to riding and my continued participation in this sport was influenced by many important discussions with other riders on the beach. One discussion about "taste" encouraged me to try a modern directional when I believed that directionals were not for me. This was due to having only experience with 2001 era directional kiteboards prior to that conversation. Pretty much any modern TT is going to feel better than those old POS tiny narrow surfboards, especially at the skill level I was at when this was going on. So a discussion on taste set me on the path that led me to my current level of happiness in the sport. Even in the fashion industry, the frivolity of a "look" or "taste" can be explained, if nothing else than how it compares to other looks. It is not beyond (average) human comprehension to convey ones reason, and feelings with regards to "taste" for one thing vs another. And even in the fashion industry lead by a few top designers, the "innovations" in style are just copied by the designers who are less noteworthy than those top designers. Very little innovation seems to come from the bottom up, or so it seems when you buy into the hype. So do you still think that "taste" is not something you can understand to the point which you can convey it to another person? Or did you drunk post that one? You've stumbled upon the most awful TT I've ever tried: Glide 160x40. I'm about 185cm tall, 70kg, and with my height I thought the length would be acceptable... wrong. Powerful edging is nearly impossible with a board that long, so the wind range ends up being tiny. It's immediately disturbed by any chop, and having such a long distance between your rear foot and trailing edge of the board makes it impossible to dig in your heel. I totally understand why 'wide' boards (instead of 'long') are more popular now. this guy will probably out talk anyone on his path. He will probably argue with Toby why using 126x36 board when more "advanced" boards are on the market. But, he showed us his skills, now we know Quite stylish hey! Matteo V, me lovely mother thought me long time ago that discussion about the taste is pointless. I'll stick to this, thanks. I would suggest to ask Toby about the style, discipline and training, preferably with the same gear over and over. In less than 500 words please. Does have a certain charm. Dude, your such a brown nosed super fan! This is like watching a couple mathletes in a staredown. So we can all admire your style. Other than that, have no idea what u just wrote, yank ‘red neck’ tongue isnotmyforte. Plus, use a “foe” feature, it does work. I use it all the time. I very much agree, but this topic has been gone over before and (to my surprise) there are fans of that board out there. I have used the Glide never owned one of the long/skinny versions of that board. My opinion of it is that it is one of the fringe developments in kiteboarding that went too far. Similar to the "lil phatty" Liquid Force pump - talk about going the wrong way! Maybe that pump was good for travel, but I would never accept one for free. My interest in this is that I too use a board on the fringes and "not in style". The Kitefish has some huge drawbacks and is pretty much wrong for kiting in many ways for average users of average weight. And even at my weight, it still has some limitations compared to a quiver of surfboards. I just happened to have a need for it's "unbreakability" and was forced to use the Kitefish for a month when I had trashed all my other "real" surfboards. Now I have adapted to it and make it work. So maybe I will give the longer/narrower Glide model a chance if I come across one. I really hated my kitefish at first, but now I am tuned to it. .....He will probably argue with Toby why using 126x36 board when more "advanced" boards are on the market. But, he showed us his skills, now we know Quite stylish hey! I will do my best to accommodate your request for "something short to read". Though I must admit I am a little lost on your reference to Toby and hist style. Actually I do use the same kites which are no longer made and from a defunct company across my entire water quiver. And they are beginner kites too, though there have been many advances that have produced much more easy going beginner kites since the time that Kahoona's were widely used for that purpose. I also use a board that very few kiters actively utilize. If I want to pick up a used one, I know kiters that have them still in the packaging, or lightly used. But they NEVER use them. 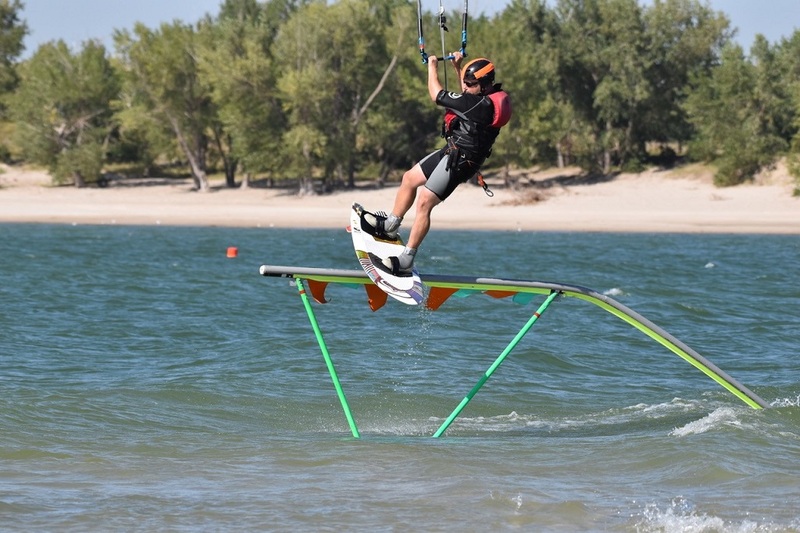 I actually can name only one kiter that uses the Kitefish on the coast, and I have seen one that a guy put "wake boots" on (finless) for riding sliders in Hood River. And honestly, that is where I got my idea to use it on a rail since I had given up all my TT's. Let me apologize right off the bat if you take this next part as insulting to you or anyone close to you. I do not intend it that way nor am I suggesting that this is in fact applicable to the specific case above. Put simply, I do not intend to insult you or your lovely mother.